Hi guys, On this page I'm sharing with you my top ten list of concrete hand tools. 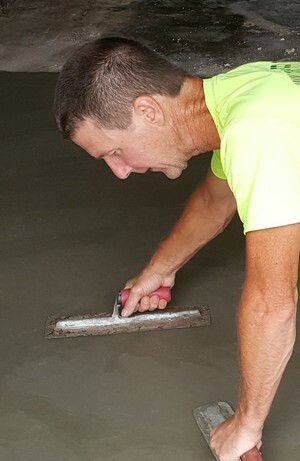 I'm Mike Day, owner of Day's Concrete Floors, Inc. 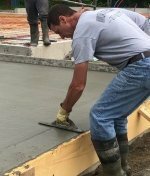 I specialize in pouring and finishing all kinds of concrete flatwork like floors, slabs, pool decks, sidewalks, patios, and driveways. I use these 10 hand tools just about every time we pour and finish concrete. I feel like they are a "must have" kind of tool if you're in the flatwork business. 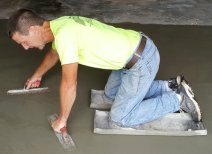 If you're going to install any kind of concrete flatwork, you will need some type of concrete screed. There's a lot of different types and brands to choose from, for the most part they're all pretty good quality. This is the kind I use. It's 1.5" x 3.5" x 8 feet long. I also have 10, 12, and 14 foot long screeds. After screeding the concrete you need to run the bull float over it. I use this exact type of bull float when I install concrete floors. I like the rounded edges it has. A rounded edge bull float doesn't leave as much of a line behind as a square edge bull float does. The rock-it bracket on this one makes it easy to tilt the bull float up to push it out, then spin the handles to tilt it the other way to pull it back. I usually use at least two of the quick connect push button handles when I pour, this gives you about 14 feet of reach when you extend your arms. If you want more reach, get an extra handle. 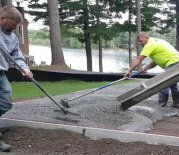 A concrete kumalong (or placer) is the best way to pull and push the concrete into place during placement. I personally like the aluminum ones, they weigh about half as much as a steel one. I pour concrete floors pretty much every day and I've had some of my kumalong's last for multiple years. I also use these to fine grade sand, gravel, and stone. They work much better than a steel rake. In the picture I'm using a Mag Float to smoothen the surface of the concrete. Out of all the tools I use, this is the one I use the most. It's because I use it to place the concrete and also to finish the concrete. There's different styles, different handles, square edge ones, and round edge ones. I prefer the square edge with a rubber handle. The square edge mag float gets tight into corners, the rounded one not so much. Other than this, both shapes work good. A steel trowel is used to finish concrete only. I'll use a steel trowel to smoothen edges, trowel around pipes and also around floor drains. On some smaller floors, I'll use a hand trowel to smoothen the entire floor. Trowels come in different lengths and widths. I like the 4" wide by 14" long one. They also come with square edges and rounded edges. I like both for different reasons. I like the square one for doing just edges and in corners, I like the rounded edge one for hand wiping an entire floor. It leaves less lines behind than a square one does. 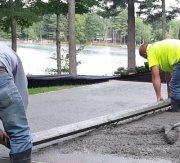 A concrete edger is used to round off the edges of a concrete pool deck, sidewalks, slabs, driveways, and garage door openings. I'm using one in the picture to round off the edges of a propane tank pad. I'll broom finish the pad, then use the edger again to leave a picture frame look to the slab. I mainly use this 6" steel edger for slabs, decks, and patios. And I use a 4" one for door openings. 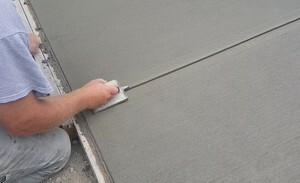 A concrete hand groover is used to leave a decorative joint line in the concrete. The joint line also gives the concrete a place to crack when it expands & contracts. 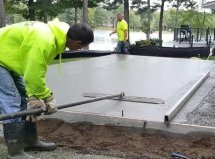 Groovers are used a lot on pool decks, driveways, sidewalks, and patio slabs that have a broom finish. 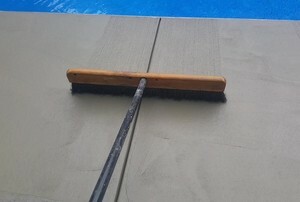 A concrete finishing broom is used for a lot of exterior finishes on concrete driveways, patios, walkways, and pool decks. I'm leaving a broom finish on a pool deck in the picture. I use a 24" and a 36" wide broom for most of my broom finish concrete. Most any standard broom handle will screw into the broom head. You can also use bull float handles if you have ones with a screw tip. 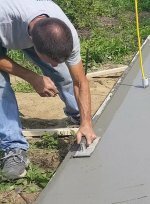 I use concrete kneeboards, or sliders, for hand wiping floors, to mag and trowel edges, and to mag the concrete before a broom finish or a stamped concrete finish. It's a tool I use about every time I finish concrete. This tool makes my job a lot easier. I like the stainless steel ones that slightly tip up on the front and back edges and have rubber kneepads already connected to them. I know, concrete boots aren't technically a hand tool, but I consider them one of the most important "tools" I use to do concrete work. I couldn't do my job without wearing concrete boots. If concrete comes into contact with your skin for a short amount of time it will "burn" you skin. They don't have to be real expensive, they just need to be effective! You can purchase these at most any store that sells shoes and boots, here are some concrete boots, like I wear, from Amazon. That's It! 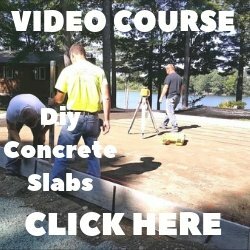 These are what I feel are the top ten concrete hand tools you'll need if you're doing any kind of concrete flatwork. If you're new to this business and you have these 10 tools, you're off to a good start. 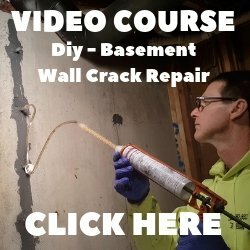 If you're a DIY'er pouring you own concrete, this list will give you a good idea what tools you'll need to get it done. Listen to me talk about my Top Ten List of concrete hand tools.